Historians disagree about the causes of the Second World War. Some trace it back to the anger created in Germany by the Treaty of Versailles. Some blame Neville Chamberlain and the appeasers for being too weak. Some ascribe it to Hitler’s aggression. The war broke out when Hitler invaded Poland. Britain declared war two days later, on 3 September. 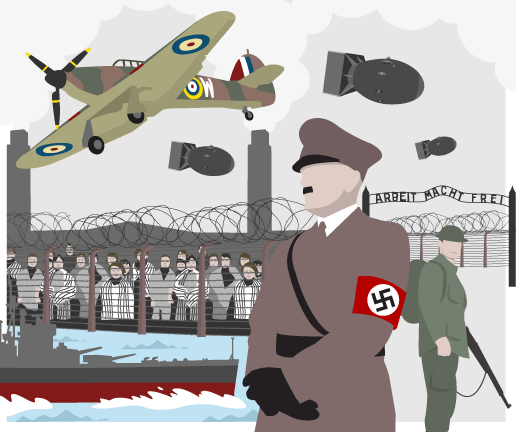 At first there was a ‘Phoney War’ – nothing happened – but in 1940 the Nazis attacked. Their Blitzkreig tactics quickly destroyed the Allied forces, and the British army was evacuated from Dunkirk. For a while, Britain faced the Nazis alone, and had to survive the Battle of Britain and the Blitz. In June 1941 Hitler invaded Russia and in December 1941, the Japanese attack on Pearl Harbor brought America into the war. The war became a truly global conflict. Meanwhile, in Europe, the Nazis implemented their ‘Final Solution’ to exterminate all Jewish people. The critical battles which changed the course of the war were at Midway in the Pacific (June 1942), El-Alamein in Africa (November 1942) and Stalingrad in Russia (January 1943). After that, the Allies never lost a battle. On D-Day (6 June 1944), the Allies invaded Normandy. The Soviet Red Army was advancing from the east. Hitler committed suicide, and Germany surrendered (7 May 1945). On 6 August 1945 the Americans dropped the atomic bomb on Hiroshima, and Japan surrendered on VJ Day (15 August 1945). The Second World War took place on a global scale. You may wish to compare the Second World War to other major wars, such as the First World War. You may also wish to look at the section on Conflict through time and the UK. In 1929 an economic depression, starting in America, spread across the world. Millions were thrown out of work – some starved to death. In Germany and Italy, fascist dictators came to power. In Japan, the army took power. Japan invaded Manchuria in 1932. Italy invaded Abyssinia in 1935. Hitler built up a Greater Germany in central Europe. In 1938 he united Austria and Germany, known as the Anschluss, and demanded the Sudetenland, the German-speaking areas of Czechoslovakia. Faced with aggression like this, the League of Nations was powerless. World leaders like the British Prime Minister, Neville Chamberlain, and France’s Daladier tried a policy of appeasement – negotiating with Hitler and being reasonable. In September 1938, the Munich Agreement they gave Hitler the Sudetenland. The Czechs were not asked what they thought about it. 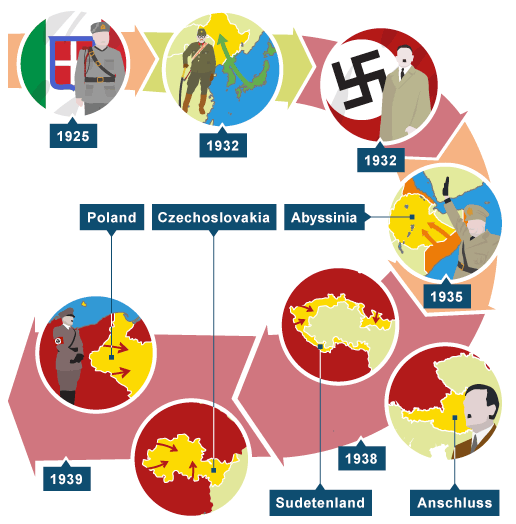 In March 1939 Hitler occupied the rest of Czechoslovakia. In September 1939 he invaded Poland, and Britain declared war. Hitler conquered Poland. There was no other major activity. The Nazis conquered Denmark, Norway, Holland, Belgium and France. The British Expeditionary Force was trapped at Dunkirk, but managed to withdraw by sea back to Britain. Britain defeated the German Airforce, called the Luftwaffe, in the Battle of Britain (July‒September 1940). The Luftwaffe bombed London for 76 nights running (the Blitz), then other cities such as Coventry. In June 1941, Hitler invaded Russia, known as Operation Barbarossa. This brought Russia into the war. The failure of Operation Barbarossa was the first major German defeat. In November 1942 the British won the Battle of El-Alamein in Africa. After D-Day on 6 June 1944, the Nazis were gradually driven back in western Europe by the British and Americans. The Americans and British launched ‘thousand bomber raids’ on German cities. Germany surrendered and war came to an end in Europe shortly afterwards and VE Day was announced on 8 May 1945. On 6 August 1945 the Americans dropped the atomic bomb on Hiroshima, and Japan surrendered and VJ Day was announced 15 August 1945. It has been estimated that 50 million people died in the Second World War. The old empires of France and Britain were ruined. A ‘wind of change’ meant that by the end of the 1960s almost all the old colonies of the British Empire had gained their independence. America and Russia were the new ‘superpowers’, and immediately started on a Cold War. The dropping of the atomic bomb on Hiroshima created a world which was terrified by the threat of atomic war. In Britain, the government promised the people who had fought against Hitler a Welfare State, which would care for its people from the cradle to the grave. Germany was divided, and remained so until 1990. The League of Nations was disbanded. Instead, a new United Nations was declared. At the time, and immediately after the Second World War, most historians blamed Hitler for starting the war. In 1961, however, AJP Taylor argued that Hitler had no grand plan to start a war – he simply grabbed opportunities as they came along. Taylor blamed the British and French politicians who appeased Hitler, which allowed him to think they were pushovers. Soviet historians agreed with Taylor. They believed that British politicians in the 1930s actively encouraged Hitler, hoping that Nazi Germany and Soviet Russia would destroy each other in a huge war. In the 1970s and 1980s, some British historians tried to defend Chamberlain, arguing that he was a skilled politician who realised that Britain was not strong enough to stop Hitler in 1938, and needed time to re-arm. American historians disagree about why America entered the war. Some have claimed the American President Franklin D Roosevelt knew about Pearl Harbor, but let it happen to give an excuse to declare war on Germany. Most believe that America came gradually to believe in intervention, and put Pearl Harbor down just to incompetence. Gabriel Kolko (1968) claimed that the Americans used the war to build up their economy at the expense of Britain and Russia. For a long time, Soviet historians presented a view of Russia’s war which explained Nazi successes in 1941 in terms of Hitler’s surprise attack and better weapons. Stalin intended to invade Germany in 1941 – but Hitler beat him to it by two weeks. The Soviet army was well-prepared and well-armed. It was defeated because it had been weakened by Stalin, who had executed many of the generals. 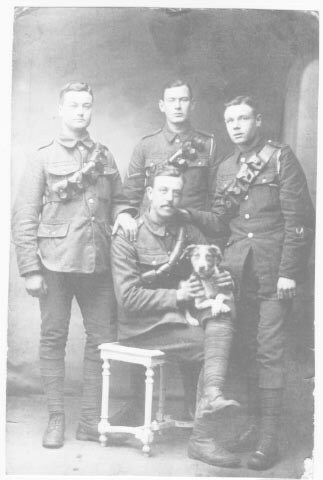 The first war films were propaganda films designed to inspire the British people. Later films emphasised the heroism of the British and American soldiers who had won the war – eg Reach for the Sky (1956) celebrated the life of Douglas Bader. In the 1950s, also, children’s comics were full of war stories about British heroes slaughtering German soldiers. Recent films about the Second World War – such as Saving Private Ryan (1998) ‒ tend to emphasise the horrors and sadness of the war.